Yesterday I wrote how to outfit your boat for trolling for trout if you have a lot of money to spend. But how about if you're on a budget? Here's some budget solutions to rig your boat for monster trout trolling. Electric downriggers allow you to fish as deep as you like, but manual downriggers are a lot cheaper. Costing about one-third of the price, they allow you to get to the same depth provided you don't mind a little exercise along the way. Check out www.scotty.com for their line of manual downriggers ranging from $150 for the full-sized ones, and as little as $70 for the laketroller variety. There's an even cheaper way to get down deep, and that's by using a variety of trolling weights. Mooching weights come in every size to get you down as deep as you like and only cost a few bucks each. An angler looking at getting into trolling for trout would do well to pick up a variety of these weights between 1 and 6 ounces to get you between 5 and 50 feet deep. While planer boards can cost $100 each, there's a cheaper way to get your line to cover more water. Yellow Bird side planers retail for about $20 each and can carry your line up to 150 feet out either side of the boat. Check out their website at www.yellowbirdproducts.com for more info. Step One: Take both pieces of plywood and use a drill to make two holes in each board. The holes should be on an imaginary along the equator of the board and one foot apart. The back hole should start 6 inches from the back of the board. Step Two: Take a skill saw and cut a 45 degree angle along the front of each board. 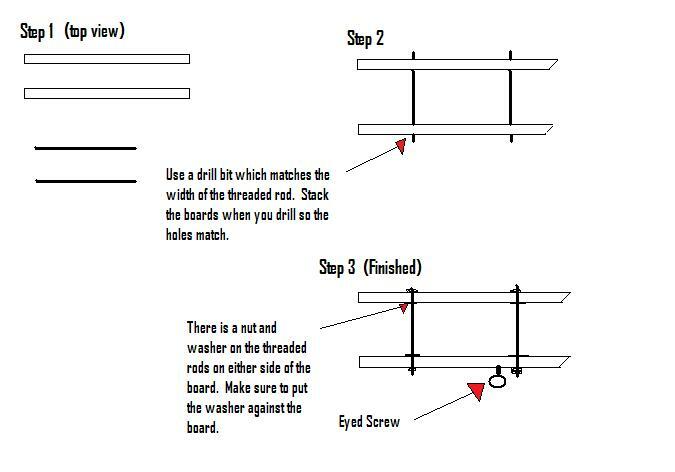 The top view of each board should look like the boards on step 2. Thread two nuts on each rod so they are 14 inches apart and place a washer on the outside of each. Then place both boards on the rods against the washers. Step Three: Place washers and nuts on the rods on the outside of the boards so each one is locked in place. Then screw your eyed screw into the inside board just behind the front rod. Now your board is ready to go! The board in step 3 is rigged to fish off the left side of the boat. Use 150 pound braided line on your planer board to get the best performance and Scotty 1043 or 1048 planer board releases to attach your fishing line to the planer line. That's it. Now you're set to catch more fish by increasing your vertical and horizontal fishing space. Now let's see those monster trout!